« 3D Printing: Oh, The Tuning We Shall Do. Starting with ViaCAD and my trusty Calipers, I came up with the seed basket that you see to the right. It seems to work quite well (2 of the 7 pods full of seeds have sprouted in less than a week — and I happened to start with old seeds for this run). 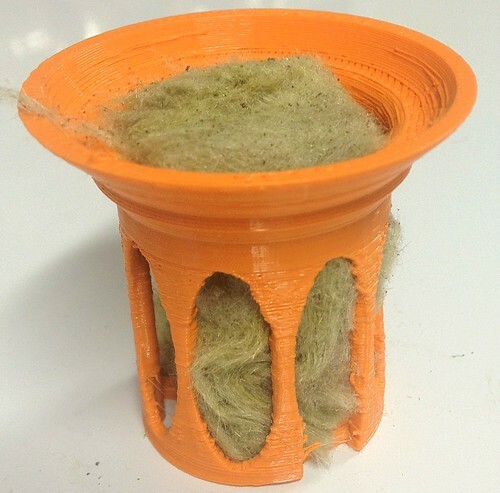 In particular, it is designed to hold significantly more growing medium (Rockwool growing medium ) and has a little notch in the bottom that locks into the little water spout that is in the hole that the basket is inserted into. It should provide a more stable growing medium for the plant’s roots, while ensuring that a more consistent amount of nutrients arrive at the plant. However, this particular project, more than anything, was proof that ViaCAD is really not terribly well suited at all for this kind of modeling. I ended up with an “infinitely thin” section of the model such that no slicer settings would yield a print that was durable enough to be used. Fixing this issue proved to be a nightmare; ViaCAD’s UI just doesn’t give either enough feedback nor control to figure out and fix such an issue. There are too many ways during modeling where a seemingly innocuous step cannot be reversed or otherwise makes vast swaths of the model’s geometry no longer editable. I also printed a bunch of lids to go over the top of the baskets. These keep the moisture in when the seeds are sprouting and until the seedlings mature a bit. Total overkill; any old plastic rounded lid like thing would do. Overall, I suspect this is going to be mostly a failure with a couple of very water tolerant plants thriving. I need to figure out a way to decrease the moisture retention a bit, I think. Hrm. This entry was posted on Monday, May 14th, 2012 at 12:31 am	and is filed under Gardening, Technology. You can follow any responses to this entry through the RSS 2.0 feed. You can skip to the end and leave a response. Pinging is currently not allowed. my thought was to cull the seeds from the hydro-seeded plants and use them rather than un-hydro-seeded seeds which should make the hydro-seeded seeds more likely to adapt to the extra moisture. (too many hyphens & seed words). oops, just had another thought(2 in one day). you may be able to use the K-Cups(another hyphenated word) from those single coffee makers such as Keurig, to place the seeds in. 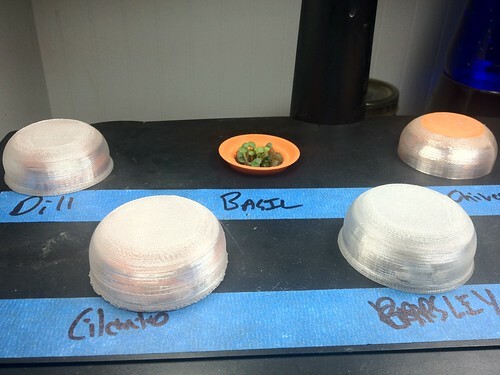 Just curious if you’ve looked at the hydroponic pots on Thingiverse? I’ve been thinking about trying to print one of these for use in my WindowFarm inspired herb garden.